A couple of years ago, by a wafer-thin majority British voters indicated that they wished the United Kingdom to leave the European Community. In 1970 they had elected a Government which favoured joining the Common Market and in 1975 had, by referendum shown that they wanted to stay in it. In the UK the Queen in Parliament is sovereign and referenda are advisory, not binding. BREXIT may mean Brexit but it has no tradition, no lineage in the land of John Bull. 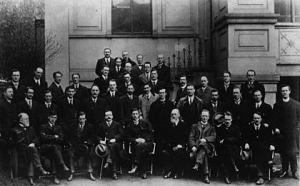 Finally, in 1918, in the first election when every man over 21 for the first time had a vote, and some women were given the vote, courtesy of their British overlords*, 73 Irish constituencies (out of 103) chose Sinn Fein candidates pledged to establish a sovereign, independent, Irish Republic forthwith, without asking Britain’s permission. The London Times conceded that the election had been seen on all sides as a plebiscite. And the plain people of Ireland had spoken. They wanted the British Crown, Parliament, All the King’s Horses, all the Kings Men, agents, hangers-on and sycophants out of Ireland. They wanted Britain’s Exit from Ireland. BREXIT, you might well call it. That was all of ONE HUNDRED YEARS ago.